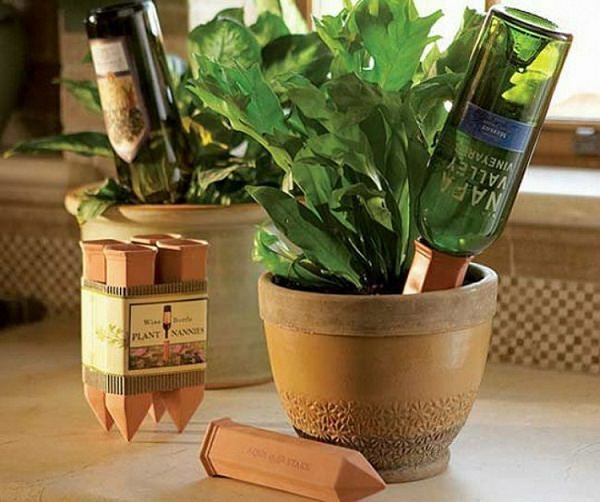 The terracotta stakes are fitted with a wine bottle that is full of water and stuck in the plant’s soil. As the terracotta absorbs the water, it will slowly leak it into the soil and keep the plant’s roots moist. See more wine bottle uses in the garden. 2. 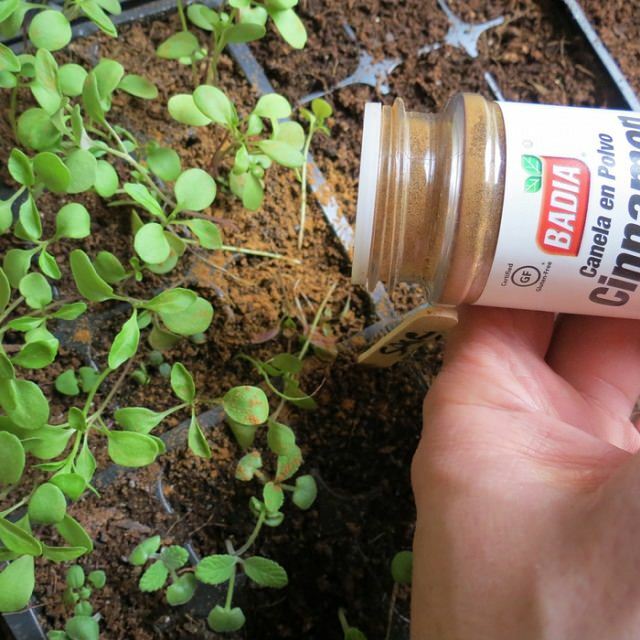 Cinnamon powder on seedlings to prevent diseases. Cinnamon has some anti-fungal qualities, and it smells great as a bonus. Use it to prevent and stop diseases on seedlings. Find out more on it. 3. No watering can? No problem! 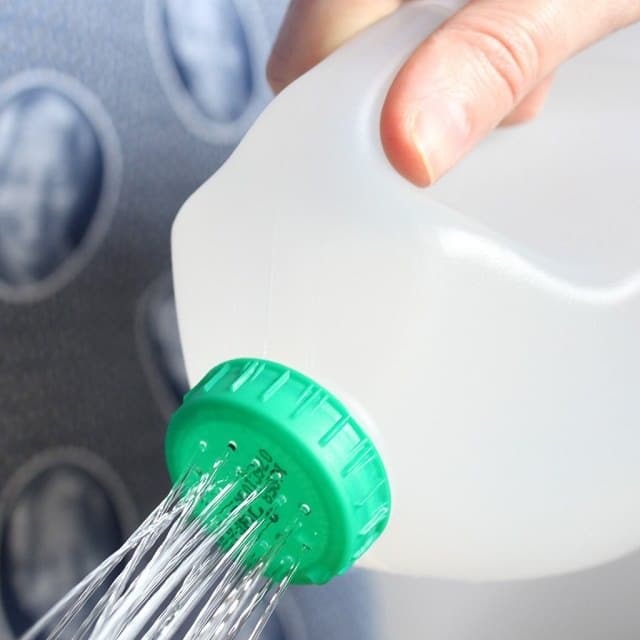 This super simple hack of an old milk jug is perfect for a new gardener that hasn’t gone out and bought a watering can yet. Just upcycle your old plastic milk jug by heating up a needle and poking holes in the lid so water can flow through it freely. Check out the tutorial here. 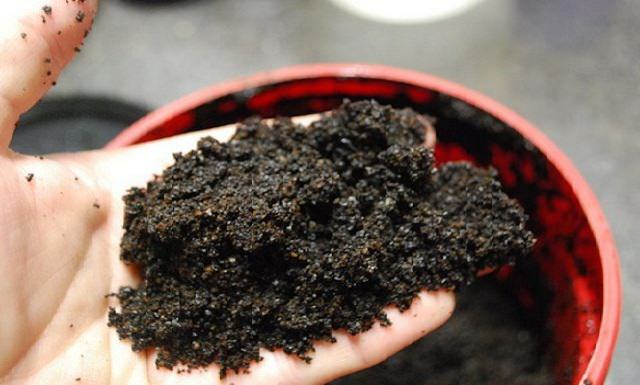 Use used coffee grounds to keep pests like ants, snails, and slugs away. There are many other coffee grounds uses you can check in the post. Just poke a hole in the bottom of the peel for drainage, fill it with potting soil, then sow seed and sprinkle some water. 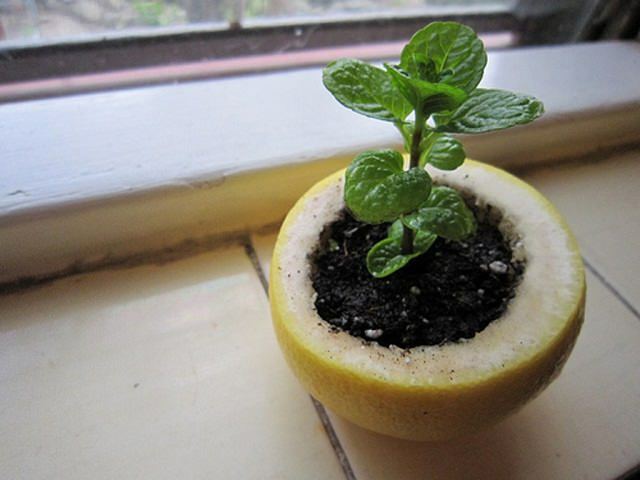 When the seedling is ready for transplant, plant it directly in a garden or in a container with the peel. The peel will decompose and nourish the young plant as it grows. Learn more about it. Another way to protect your plants against pests is using egg shells. 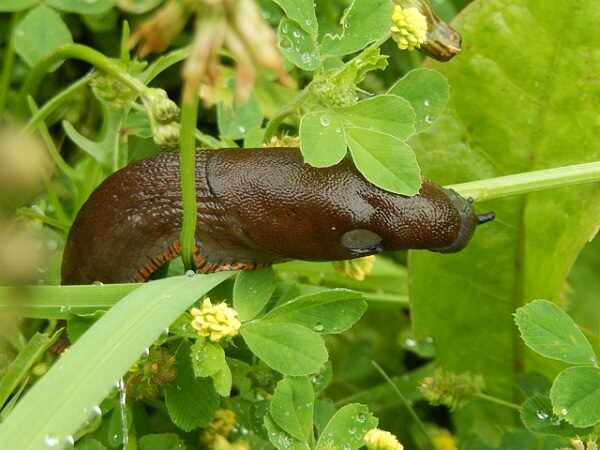 Coarsely crumbled, egg shells form an effective barrier against soft-bodied garden pests like snails and slugs that eat your plants. They do not risk through this sharp and uncomfortably jagged shells. To do this, encircle roughly crushed layer of eggshells around the plants that are sensitive to such pests. Find out more uses of eggshells in the garden. If you’re going on a vacation for a few days and don’t have a way to keep your indoor plants watered, keep them alive with one of the clever gardening hacks. Simply roll up some paper towels as tight as possible without them breaking, dunk the ends in a glass of water, and lay the remaining across the soil so that each plant is at least a few inches away. Learn more on it. 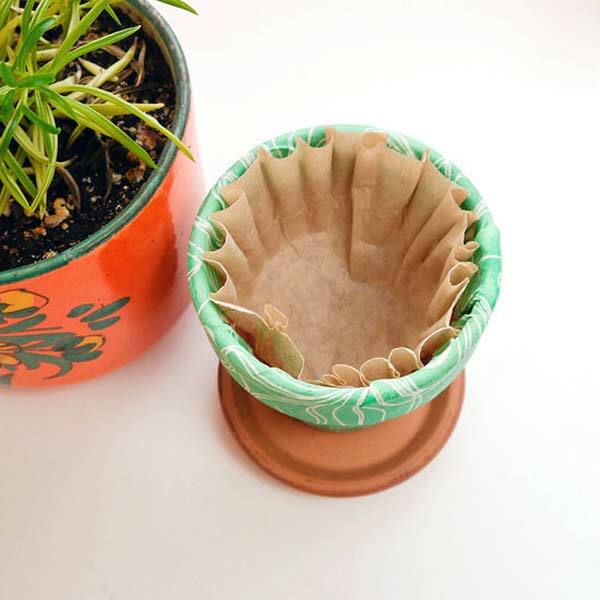 Next time you’re repotting a plant, keep the soil where it belongs with the help of a coffee filter. Simply lining the pot keeps the drainage holes in the bottom free from clogging up — and soil from sneaking out after watering. Find out. 9. 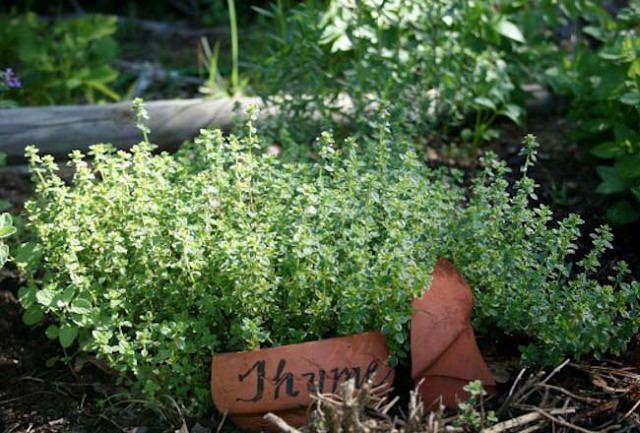 Use herbs to deter mosquitoes! Make this mosquito control pot by grouping these plants together to prevent mosquitos and flies. 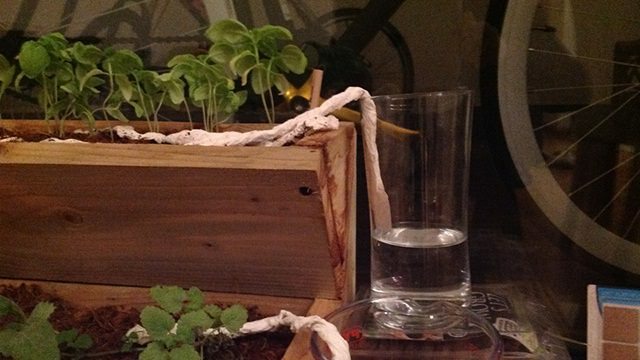 Plant label is a quick and easy way to recycle broken planters. To make it, bat the pot into desired pieces. Take the potsherds and write names of the plants with permanent marker on it or you can use a sharp object to carve name to give it a rustic look. You can also decorate it with colors when you’re done bury it half into the soil. See more ideas on using broken pots in the garden. 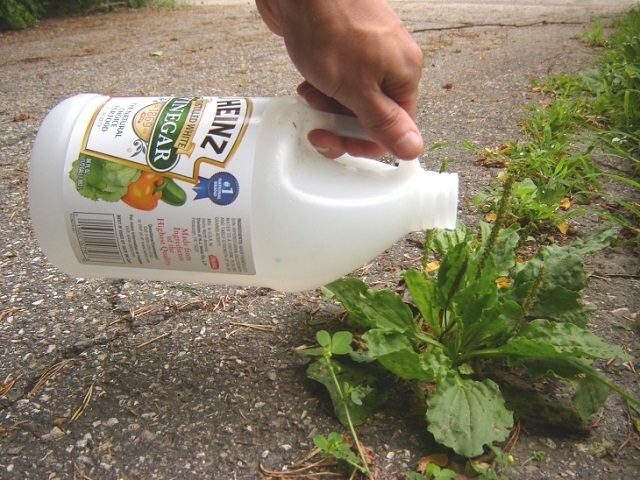 If you want to get rid of those pesky plants in your garden that pop up again & again, use vinegar. Shipping pallets can be found for free at many hardware stores, furniture stores or even construction sites. 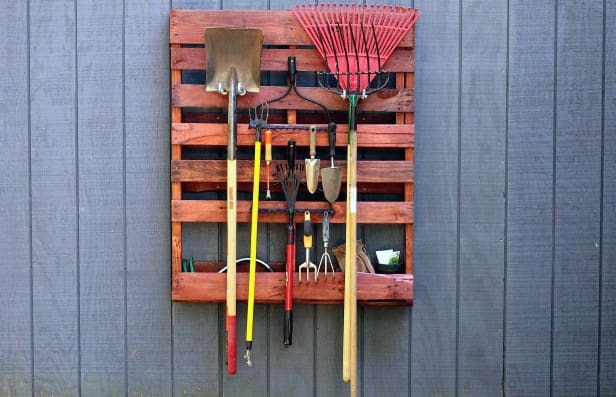 Using a recycled pallet, recycled bow rake heads and less than ten dollars worth of hardware it’ll be ready, this garden tool rack has a rustic appeal and will help to wrangle the many garden tools one accumulates. Check out the DIY tutorial on HGTV. Hydrogen peroxide can be so useful for your plants, it can save your plants from root rot and many fungal diseases. It also helps to sprout seeds for new plantings. Use a 3% hydrogen peroxide solution once a day and spritz the seed every time you re-moisten. 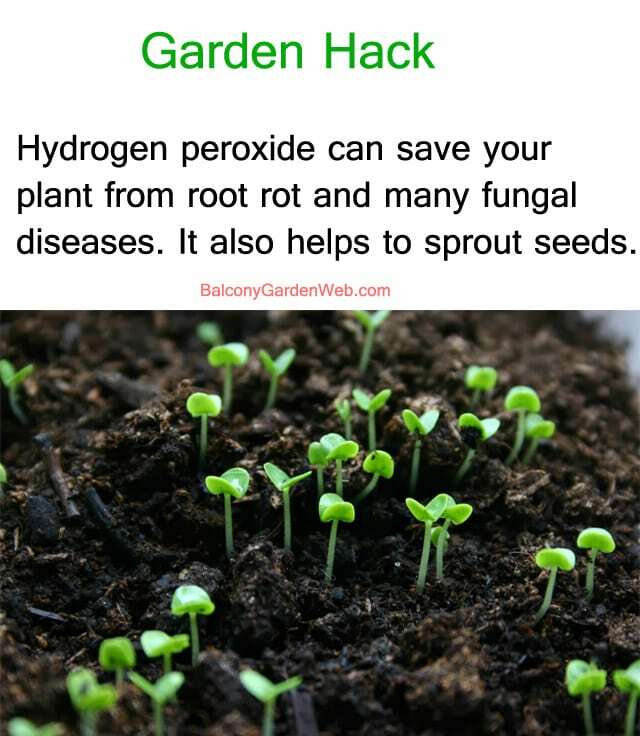 You can also use a mixture of 1 part hydrogen peroxide to 32 parts water to improve your plants’ root system. Read many more hydrogen peroxide uses on ONE GOOD THING. 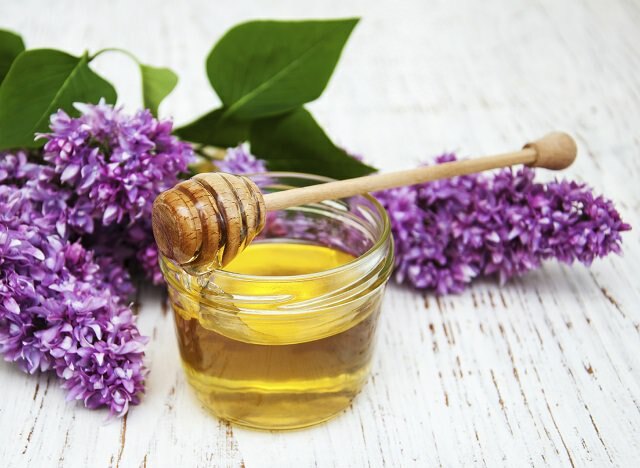 Honey contains enzymes that promote root growth, and you can use it as a ‘Rooting Hormone’. Honey help plant cuttings in setting roots and they propagate easily, it also saves them from fungal problems. Read how you can use honey to propagate cuttings on Gardening know-how. Make a tool holder from a terracotta pot and add abrasive sand, and mineral oil in that. 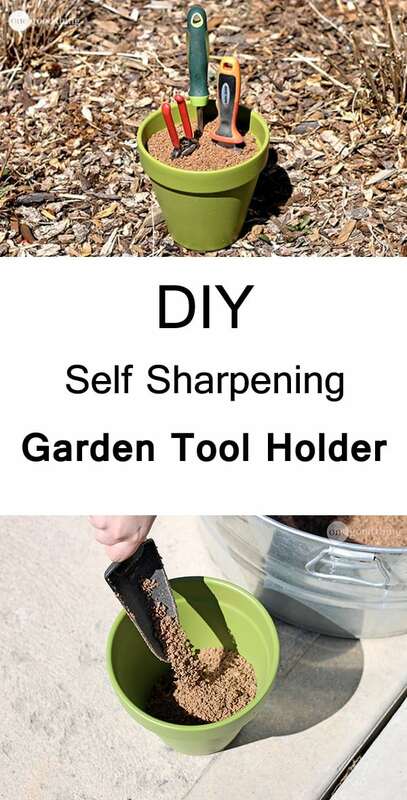 It will not only hold your garden tools as you thrust them in but the sand and mineral oil mixed in it also clean and sharpen them at the same time. Read more of this ingenious idea on One Good Thing. Quirky idea but useful. Lay diapers with the absorbent sides up and they will retain moisture for a long time. This gardening hack is useful for hanging baskets, shallow pots, and especially if you live in a really warm climate. If you want to know more about this idea, click here. Use Epsom salt when you transplant your plants to save them from transplant shock. 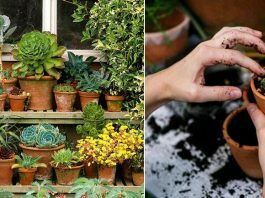 When planting seedlings or new plants, dig a hole and place about 1 tablespoon of Epsom salt in the bottom of the hole and cover with a thin layer of dirt, place the plant in the hole and finish planting. When you boil or steam some vegetables on the stove top, don’t pour the water down the drain. Once the water has cooled, pour this vegetable water in your plants to fertilize them instead of wasting it. You can also do the same with your boiled egg water. Pinch the tips of young plants for bushier growth. 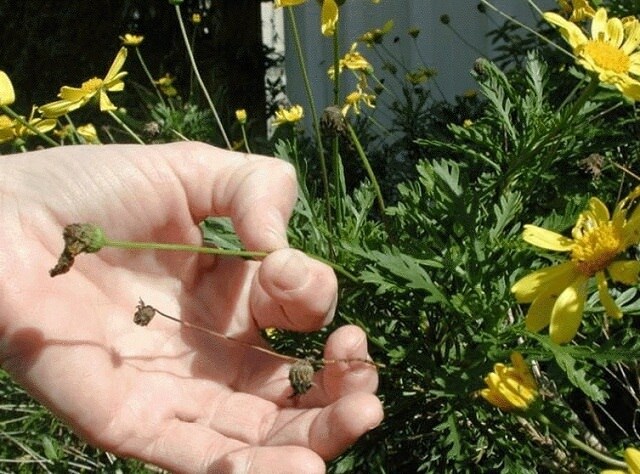 Deadhead spent flowers from your plants to promote more blooms and remove top shoots and emerging flowers of your herbs to help them have a healthy growth and prevent bolting. Also, most of the new gardeners avoid pruning their plants but it is important too and helps in rejuvenating the growth of plants. If weeds are surfacing in your garden do this: Before you put a layer of mulch on your planting beds, cover the garden bed with newspapers and then drop a layer of mulch to smother the weeds. 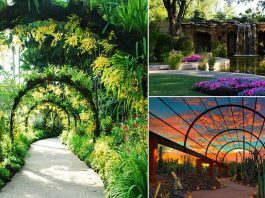 Read more about this ingenious idea on A garden for the house. 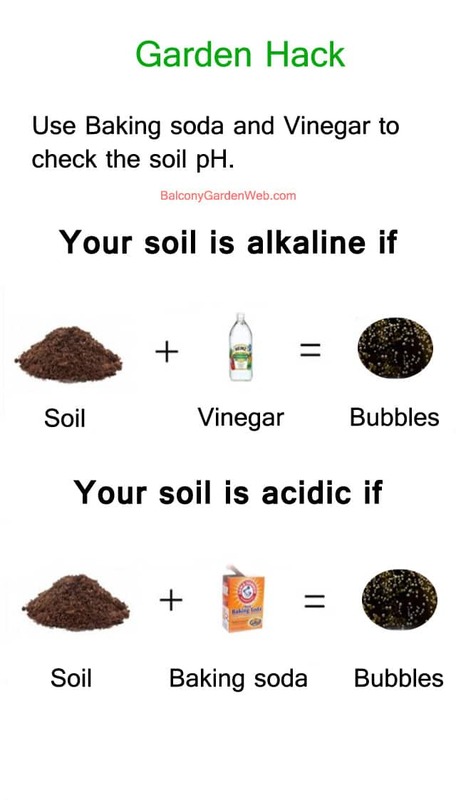 Check the soil pH at your home. It’s true you are not going to find out the exact value from this test, but it will tell you whether your soil is acidic, neutral or alkaline. See our DIY post for more information. Get a ladder plant stand like this to put your plants on it and to create more space. It can be a good addition in a limited space container garden. These are some great ideas except for using diapers. There are way too many diapers in the landfills as it is and as they don’t decompose these should not be used – as gardeners we like to think that we are re-using items or using ones that eventually decompose. Agreed. There are also some pretty toxic chemicals in disposable diapers. I wouldn’t be ok with them against a child’s skin and I sure don’t want them in my garden soil. I use a small piece of newspaper in bottom of potted plants instead of buying coffee filters. Cardboard is much thicker and lasts longer than newspaper for a weed barrier. I use a standard cheap small step ladder and place recycled plants of wood on each tier (usually some cutting is required). 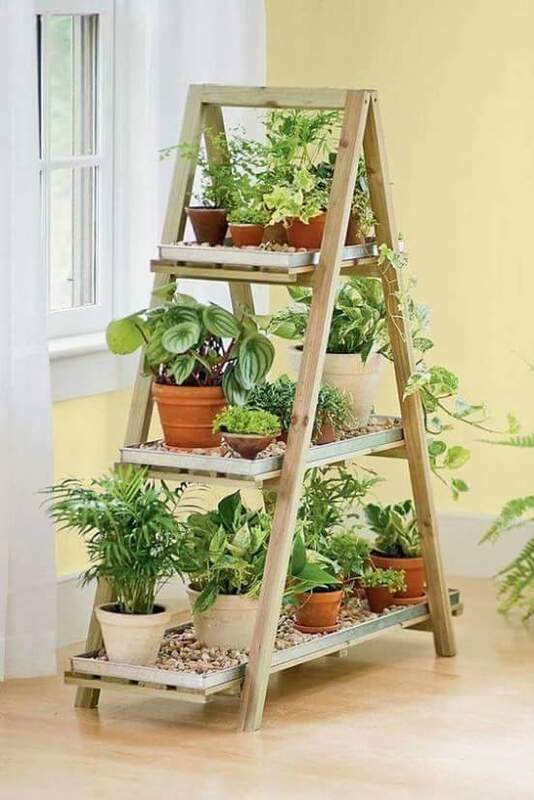 I think this is a really good “green” way for using a ladder plant stand. I will definitely start using the tip for fertilising my plants with vegetable stock from dinner. I’m betting this will increase growth and plant yields. just awesome…something new to me!! thanks guys and girls for putting this up!! Take shipping peanuts used in boxes to pack and mail something. Place these in bottom of pot serves as venting from bottom as well as quick fix for loosening r dirt out the bottom. This is very much important indeed, i have learned many things. Please send me your daily/weekly/monthly newsletters. Another tip is to grind up cleaned and dried egg shells and to incorporate into the soil where you have tomatoes growing. This helps prevent calcium deficiency. If you are in the tropics/subtropics, you can use old coconut shells as hanging planters! 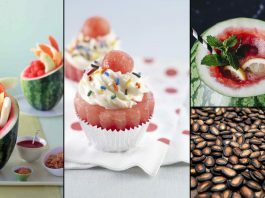 Wonderful tips!! I tried the one with the vinegar and I`m happy I saved my garden so easy from these bad weeds!